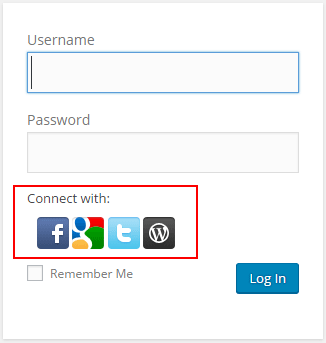 You can use a WordPress social login plugin with WP eMember to allow users to log into the site using social media login. Your users will be able to go to your WordPress login screen and log into the site using a social media platform. When the users log into your site as a WordPress user, they will also be logged into the eMember system automatically. This allows the users to access the content that you have protected using eMember. Step 1) Install and configure your social login plugin and test it to make sure the standard WordPress login process (via this plugin) works correctly on your site. Step 2) Go to WP eMember plugin settings and enable the options under the “WordPress User Integration Settings” section. Read this documentation to learn more on what that settings does. This option will auto create an eMember record when your Social Login plugin creates a new WordPress user record. This is to allow visitors (who do not already have an account) to create a free basic eMember account so they can be logged into an eMember profile. Later that user can upgrade his account by paying for a premium membership. The login aspect is just for members to be able to log in from the WP user end. It allows them to log in from the WP User end and they get logged into their corresponding eMember profile automatically. However, you still need to have a game plan as to how your members actually pay you and register for membership account on your site. All of that is handled by the member registration process documentation.